With ‘Terrier’ No. 32670 being withdrawn from service at the end of the year, Geoff Silcock reminisces about the 12 consecutive days in August that saw two of the class rostered for more than 500 miles of timetabled running. No. 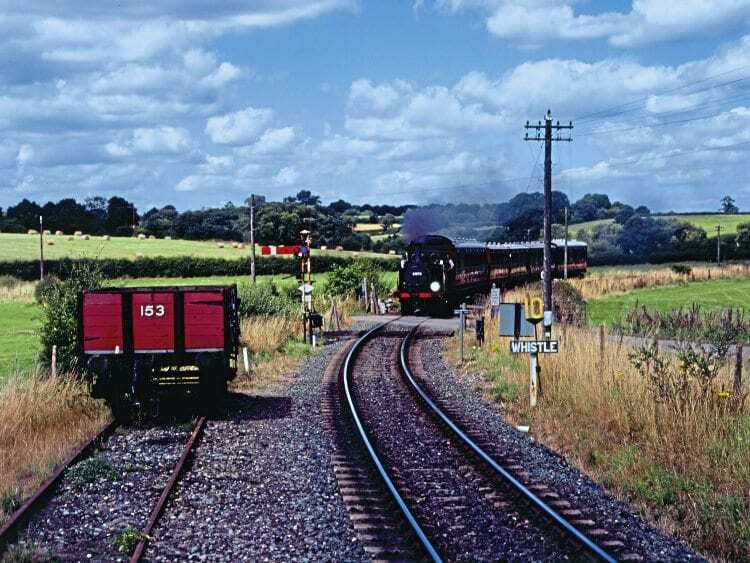 3 Bodiam has been on the Rother Valley/Kent & East Sussex Railway (KESR) since 1901, latterly running as No. 32670, but will be withdrawn active at the end of 2016. For the last few years the KESR has incorporated two unmanned ‘ghost stations’ not included in the current timetable. Stroudley A1X ‘Terrier’ 0-6-0T No. 32678 heads the 12.45am departure from Bodiam up the 1-in-50 Tenterden bank and Stroudley A1X ‘Terrier’ 0-6-0T No. 32678 heads the 12.45am departure from Bodiam up the 1-in-50 Tenterden bank and approaches Cranbrook Road crossing on July 31. When the yearly sabbatical to the South Coast was again mooted for the start of August, there seemed little chance that the two native KESR BR-liveried ‘Rooters’ would be rostered again for passenger duties towards the start of the main August holiday season workings. The upgrading of the dynamic duo’s capabilities, as unburdened in HR last year by yours truly, had provided several extra days of operation towards early August 2015, with both of the 1872 and 1880 thoroughbreds working separately. However, nothing this time had quite prepared me for the 12 days that they would work turn and turn about ‘rooting’ with the KESR vintage set of coaches, which include the South Eastern & Chatham Railway Birdcage brake and special bogie saloon, and nearly equalling their maximum tonnage consist up the 1-in-50 Tenterden Bank. Next Post:If the Kiwis can do it, why not Transport Heritage NSW?